Are you looking for a sensational outdoor sporting or recreational activity? Then try kayaking. Apart from offering you a relaxed feeling of moving upon the water, the activity can be a great networking event where friends and teammates can have fun together. On top of that, kayaking has many health benefits. If you find an opportunity to evade daily routine, don’t wait for another chance. With the coming of inflatable kayaks, people no longer consider it a special indulgence to own one. The good thing is that it’s easy to store yours anywhere. Take your kayak during one of the weekends and get the health benefits below. The most popular ways of shedding some extra pounds include running and cycling. They may not be as fun as kayaking. However, the effectiveness of all these methods is the same. You have to move your body together with the kayak over the water, and that’s using strength. Just one hour of kayaking can burn up to 340 calories in a person that weighs 150 lbs. People who weigh more burn more fats because they use more energy to move their bodies. Also, the more the time you spend kayaking, the more you’ll lose weight. During paddling, you move your muscles in a particular pattern in order to attain a good stroke. Each of the strokes results in the movement of the paddle against the resistance of water. This exercises and builds certain types of muscles. Some of them include triceps, arm flexor muscles, abdominal muscles, and the upper back muscles. Kayaking and an aerobic workout are similar. You require energy to paddle. This makes your heart to pump faster and more forcefully. Also, it results in increased breathing rate, making more air to flow to your lungs. This opens up your heart, lungs, and muscle blood vessels. However, this depends on how intense and fast your paddling is. If you paddle faster, there would be a greater impact. The effects of kayaking are very valuable in the prevention of cardiac diseases. If you do it regularly, your blood pressure can reduce because the workout makes your blood vessels to dilate. Although you may be seated the whole time, kayaking still works out your legs. You have to coordinate your leg muscles and the trunk to turn and balance the kayak. As you repeat these movements several times, you’re working out the hip muscles, some feet muscles, and thigh extensor muscles. 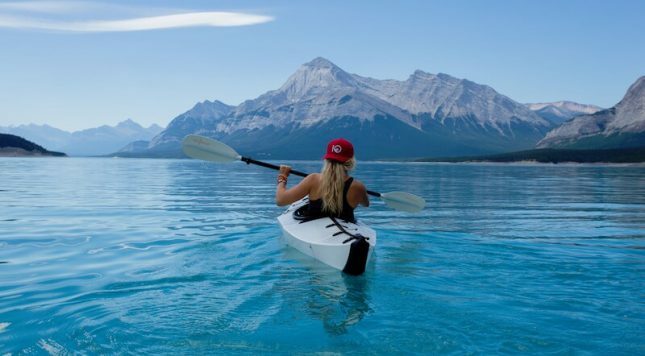 It’s not just your physical body that benefits from kayaking. Your mind is also a beneficiary. All physical activities, including kayaking, result in the release of endorphins. These types of hormones make you feel good after hours of paddling. Kayaking also provides a relaxing environment that reduces stress. Kayaking can be as fun as it is healthy. It promises to revitalize your physical body as well as your mental health. You don’t have to wait longer to begin exercising and having fun in a healthy way over your weekends and holidays. Purchase a kayak today and begin the journey. Get an inflatable one for convenience.